The onset of ADEM usually occurs in the wake of a clearly identifiable febrile prodromal illness or immunization and in association with prominent constitutional signs and encephalopathy of varied degrees. ADEM is typically a monophasic disease of pre-pubertal children; whereas, MS is typically a chronic relapsing and remitting disease of young adults. Abnormalities of findings on cerebrospinal fluid (CSF) immunoglobulin studies are less common in ADEM. However, the division between these processes is indistinct, suggesting a clinical continuum. Moreover, other conditions along the suggested continuum include optic neuritis, transverse myelitis, and neuromyelitis optica - clinical entities that may occur as manifestations of either MS or ADEM. Other boundaries of ADEM merge indistinctly with a wide variety of inflammatory encephalitic and vasculitic illnesses as well as monosymptomatic, postinfectious illnesses that should remain distinctfromADEM, such as acute cerebellar ataxia (ACA). A furtherindistinct boundary is shared by ADEM and Guillain-Barré syndrome as manifested in cases of Miller-Fisher syndrome and encephalomyeloradiculoneuropathy (EMRN). Susceptibility to either ADEM or MS is likely the product of multiple factors, including a complex interrelationship of genetics and exposure to infectious agents and other environmental factors. Of particular interest are the indications that susceptibility to either condition is in part age-related. Most cases of ADEM possibly occur as the result of an inflammatory response provoked by pre-pubertal infection with a virus, vaccine, or other infectious agent. Typically, the manifestations of ADEM occur quickly after this pre-pubertal febrile systemic illness and are monophasic. In a minority of cases, patients with ADEM experience one or two pre-pubertal recurrences followed by remission. MS, on the other hand, typically manifests as a relapsing-remitting illness in ensuing adolescence or young adulthood, a significant and unexplained latency of effect with apparent permanency of immune dysregulation. Bouts of MS occur without a febrile prodrome. Uncommonly, MS develops in pre-pubertal individuals andADEMdevelops in post-pubertal individuals. In very rare instances, individuals manifest pre-pubertal ADEM and, after long latency, MS in adolescence. Multiple sclerosis (MS) and acute disseminated encephalomyelitis (ADEM) bear a close pathological resemblance, each resembling the pathology of experimental allergic encephalomyelitis (EAE). The prominence of perivenular round cell inflammation in either illness is a feature that is shared with many forms of encephalitis, but patchy demyelination with preservation of axon cylinders and the prominence of microglial cells in the inflammatory exudate are not. The pathology of various developmental stages of the MS plaque is more fully characterized than the pathology of the lesions of ADEM. This is because most patients with ADEM recover completely and without apparent pathological residua. Few biopsies have been obtained or submitted to postmortem analysis. MS plaques are known to exhibit organization features, especially in the margins of active plaques that are not found in cases of ADEM. On the other hand, the general pathological similarities suggest but do not confirm the possibility that ADEM is a forme fruste of MS that is somehow effectively and permanently controlled after one, or possibly a few, demyelinating bouts. Patients with large tumor-like demyelinating lesions may exhibit a combination of pathological features consistent with both MS and ADEM. The possible relationship between these illnesses is further supported by the similarity of clinical manifestations in either illness and the development of MS during adolescence in a small minority of patients who have had typical ADEM bouts in the first decade of life. The pathophysiological similarities of these illnesses suggest that the immunologic constitution of susceptible individuals is in some fashion permissive of ADEM, MS, or both and that the degree of susceptibility may describe a gradient with regard to severity and risk for recurrence. The threshold for an initial bout of demyelinating illness may be determined by the combination of this immunologic constitution and the nature of a given antigenic stimulus; the likelihood of recurrence may be determined by the fertility of that constitution for persistence of immuno-dysregulation. Immuno-dysregulation in MS or ADEM may consist of responses that are inadequate, too exuberant, or the combination of both. If a pathophysiological continuum between MS and ADEM exists, achieving better understanding of the manner in which susceptible individuals with ADEM are able to bring a monophasic or temporarily recurrent immuno-dysregulative response under permanent control is of obvious importance. Cases with characteristics that fall in the indeterminate area of this continuum, such as those that might be labeled multiphasic ADEM, represent an important challenge for accurate classification. In some of these cases, appropriately crediting the immune system with tardy but permanent compensation may be important, thus avoiding inappropriate diagnosis of MS, fraught as that is with psychosocial consequences. The mechanisms of these demyelinating illnesses remain incompletely understood despite the extraordinary richness and complexity of immunologic abnormalities that have been identified after more than a century of clinical, pathological, and laboratory studies. Experimental observations have depended greatly on EAE, a research model that may be more pertinent to ADEM than MS. However, the possibility of provoking spontaneously recurrent demyelination with this model further supports the concept that ADEM and MS represent a continuum. Basic studies have shown that, in the earliest stages of inflammation, both MS and ADEM are likely to be mediated by stimulated clones of T-helper cells sensitized to auto-antigens such as myelin proteins. Some studies have even identified serum autoantibodies to various myelin proteins that help to differentiate ADEM from MS. In particular, ADEM appears to be characterized by class-switched IgG autoantibodies, supporting the hypothesis of an antigen-driven immune response in ADEM cases; whereas, MS cases are characterized by serum IgM autoantibodies. The complex ensuing inflammatory cascade entails the local action of cytokines and chemokines as well as lymphokine-induced chemotaxis of other cellular mediators of inflammation (eg, other T cell lines, B cells, microglia, phagocytes). Additionally, in 2006, Franciotta et al demonstrated that adults with ADEM have higher CSF concentrations of chemokines that recruit or activate neutrophils (CXL1 and CXL7), monocytes (CCL3 and CCL5), Th1 cells (CXCL10), and Th2 cells (CCL1, CCL17, and CCL22) than healthy normal controls. Moreover, ADEM-associated concentrations of certain of these neutrophils (CXL7 neutrophil activator and the CL1, CCL17, and CCL22 Th2 activators) are higher in the CSF from individuals with ADEM than those with MS. On the other hand, CSF concentrations of the chemokine CCL11 is lower in adults with MS than in the CSF from adults with ADEM or in normal controls. CSF Th1/Th2 cytokine concentrations were not significantly different in adults with MS, those with ADEM, or in normal healthy controls. No significant differences in serum concentrations of cytokines or chemokines were noted in the 3 adult groups. These findings raise the possibility that elevated chemokine concentrations might serve as biomarkers for ADEM and that they may provide keys to understanding the nature of and differences in the pathogenesis of ADEM and MS. Whether the increasing incidence of MS at increasing distance from the equator is also true of ADEM is unknown. The seasonal incidence of ADEM within North America peaks in the winter and spring months. [55, 54] Some severe forms of ADEM, such as those that occur in the wake of measles and the severe hemorrhagic variant called acute hemorrhagic leukoencephalopathy (AHLE) are probably less commonly encountered than they were prior to widespread immunization against measles and other formerly common and potentially serious illnesses that may serve as triggers for ADEM/AHLE. Few studies have provided incidence data from other countries, thus little is known about occurrence throughout the world. Data from Germany quote an incidence rate of 0.07 per 100,000,  while data from Japan show an incidence of 0.64 per 100,000 per year. Genetic factors, prevalence of infectious pathogens, immunization status, degree of skin pigmentation, diet, and other factors may influence risk. Although older studies suggest a 10% mortality rate, the data upon which such estimates were based were obtained in epochs during which measles was prevalent, techniques for intensive care were comparatively primitive, and anti-inflammatory therapies were inadequate. Formerly, deaths occurred in patients with AHLE, a severe ADEM variant, which has become less common since children have received immunization to many common childhood illnesses. Current acute mortality rates are probably less than 2%, typically consisting of cases with fulminant cervical transverse myelitis or brain swelling. Children younger than 2 years are particularly subject to such severe presentations. See the image below. Fatal case of ADEM involving the brainstem in a 13-month-old. The scientifically imprecise concept of race does not lend itself readily to discussions of ADEM. In the author's (RSR) series of more than 150 cases, the ratio of light-skinned to dark-skinned individuals who have some contribution of genetic material from individuals who have left Africa in the past 5 centuries is approximately 6:1. In the former group, the element of African heritage from the past 5 centuries is presumed small but is in fact unknown. ADEM is found in all ethnic groups and races; referral bias complicates any assessment of relative prevalence. Regardless of race, the degree of skin pigmentation directly influences vitamin D status in any given individual. Several studies have implicated vitamin D deficiency as a contributing risk factor for multiple sclerosis, [70, 68, 67] though these studies have not been performed within ADEM cohorts. Though no clear gender predominance has been identified, a handful of ADEM cohorts have reported a slightly male predominance. [5, 54, 85] In the author's (RSR) series of more than 150 cases, the ratio of boys to girls is 1.3:1. These data are in opposition to the strong female preponderance noted within multiple sclerosis. More than 80% of childhood cases occur in patients younger than 10 years, with a mean age range of 5 to 8 years. [47, 63, 71] . Somewhat less than 20% of cases occur in the second decade of life. Incidence in adulthood is unclear, accounting for less than 3% of the reported cases; however, diagnostic overlap with MS may lead to underestimation of the prevalence in adults. Adult-onset cases of particular severity are recognized upon the basis of biopsy. These cases may manifest very large white matter lesions that involve, as is the case with childhood-onset cases, the gray-white junction of forebrain. Alper G. Acute disseminated encephalomyelitis. J Child Neurol. 2012 Nov. 27(11):1408-25. [Medline]. Huppke P, Rostasy K, Karenfort M, Huppke B, Seidl R, Leiz S, et al. Acute disseminated encephalomyelitis followed by recurrent or monophasic optic neuritis in pediatric patients. Mult Scler. 2012 Nov 5. [Medline]. Ishizu T, Minohara M, Ichiyama T, et al. CSF cytokine and chemokine profiles in acute disseminated encephalomyelitis. J Neuroimmunol. 2006 Jun. 175(1-2):52-8. [Medline]. Franciotta D, Zardini E, Ravaglia S, et al. Cytokines and chemokines in cerebrospinal fluid and serum of adult patients with acute disseminated encephalomyelitis. J Neurol Sci. 2006 Sep 25. 247(2):202-7. [Medline]. Banwell B, Kennedy J, Sadovnick D, Arnold DL, Magalhaes S, Wambera K, et al. Incidence of acquired demyelination of the CNS in Canadian children. Neurology. 2009 Jan 20. 72(3):232-9. [Medline]. Sacconi S, Salviati L, Merelli E. Acute disseminated encephalomyelitis associated with hepatitis C virus infection. Arch Neurol. 2001 Oct. 58(10):1679-81. [Medline]. Alper G, Heyman R, Wang L. Multiple sclerosis and acute disseminated encephalomyelitis diagnosed in children after long-term follow-up: comparison of presenting features. Dev Med Child Neurol. 2009 Jun. 51(6):480-6. [Medline]. [Full Text]. Chowdhary J, Ashraf SM, Khajuria K. Measles with acute disseminated encephalomyelitis (ADEM). Indian Pediatr. 2009 Jan. 46(1):72-4. [Medline]. Alves-Leon SV, Veluttini-Pimentel ML, Gouveia ME, Malfetano FR, Gaspareto EL, Alvarenga MP, et al. Acute disseminated encephalomyelitis: clinical features, HLA DRB1*1501, HLA DRB1*1503, HLA DQA1*0102, HLA DQB1*0602, and HLA DPA1*0301 allelic association study. Arq Neuropsiquiatr. 2009 Sep. 67(3A):643-51. [Medline]. Rust RS, Dodson WE, Trotter JL. Cerebrospinal fluid IgG in childhood: the establishment of reference values. Ann Neurol. 1988 Apr. 23(4):406-10. [Medline]. Callen DJ, Shroff MM, Branson HM, Li DK, Lotze T, Stephens D, et al. Role of MRI in the differentiation of ADEM from MS in children. Neurology. 2009 Mar 17. 72(11):968-73. [Medline]. Baum PA, Barkovich AJ, Koch TK, Berg BO. Deep gray matter involvement in children with acute disseminated encephalomyelitis. AJNR Am J Neuroradiol. 1994 Aug. 15(7):1275-83. [Medline]. Apak RA, Kose G, Anlar B, et al. Acute disseminated encephalomyelitis in childhood: report of 10 cases. J Child Neurol. 1999 Mar. 14(3):198-201. [Medline]. Kesselring J, Miller DH, Robb SA, Kendall BE, Moseley IF, Kingsley D, et al. Acute disseminated encephalomyelitis. MRI findings and the distinction from multiple sclerosis. Brain. 1990 Apr. 113 ( Pt 2):291-302. [Medline]. van der Meyden CH, de Villiers JF, Middlecote BD, Terblanchè J. Gadolinium ring enhancement and mass effect in acute disseminated encephalomyelitis. Neuroradiology. 1994 Apr. 36(3):221-3. [Medline]. Honkaniemi J, Dastidar P, Kähärä V, Haapasalo H. Delayed MR imaging changes in acute disseminated encephalomyelitis. AJNR Am J Neuroradiol. 2001 Jun-Jul. 22(6):1117-24. [Medline]. Trotter JL, Rust RS. Human cerebrospinal fluid immunology. In: Herndon RM, Brumback RA, eds. The Cerebrospinal Fluid. Boston, Mass:. Kluwer Academic Publishers. 1989:179-226. Nishikawa M, Ichiyama T, Hayashi T, Ouchi K, Furukawa S. Intravenous immunoglobulin therapy in acute disseminated encephalomyelitis. Pediatr Neurol. 1999 Aug. 21(2):583-6. [Medline]. Stricker RB, Miller RG, Kiprov DD. Role of plasmapheresis in acute disseminated (postinfectious) encephalomyelitis. J Clin Apher. 1992. 7(4):173-9. [Medline]. Kanter DS, Horensky D, Sperling RA, Kaplan JD, Malachowski ME, Churchill WH Jr. Plasmapheresis in fulminant acute disseminated encephalomyelitis. Neurology. 1995 Apr. 45(4):824-7. [Medline]. Sugita K, Suzuki N, Shimizu N, Takanashi J, Ishii M, Niimi N. Involvement of cytokines in N-methyl-N'-nitro-N-nitrosoguanidine-induced plasminogen activator activity in acute disseminated encephalomyelitis and multiple sclerosis lymphocytes. Eur Neurol. 1993. 33(5):358-62. [Medline]. Kuni BJ, Banwell BL, Till C. Cognitive and Behavioral Outcomes in Individuals With a History of Acute Disseminated Encephalomyelitis (ADEM). Dev Neuropsychol. 2012 Nov. 37(8):682-96. [Medline]. Atalar MH. Acute disseminated encephalomyelitis in an adult patient. Magnetic resonance and diffusion-weighted imaging findings. Saudi Med J. 2006 Jan. 27(1):105-8. [Medline]. Brinar VV. Non-MS recurrent demyelinating illnesses. Clin Neurol Neurosurg. 2004. 106(3):197-210. Dale RC, Branson JA. Acute disseminated encephalomyelitis or multiple sclerosis: can the initial presentation help in establishing a correct diagnosis?. Arch Dis Child. 2005 Jun. 90(6):636-9. [Medline]. Garg RK. Acute disseminated encephalomyelitis. Postgrad Med J. 2003 Jan. 79(927):11-7. [Medline]. Hahn JS, Siegler DJ, Enzmann D. Intravenous gammaglobulin therapy in recurrent acute disseminated encephalomyelitis. Neurology. 1996 Apr. 46(4):1173-4. [Medline]. Hartel C, Schilling S, Gottschalk S, Sperner J. Multiphasic disseminated encephalomyelitis associated with streptococcal infection. Eur J Paediatr Neurol. 2002. 6(6):327-9. [Medline]. Holtmannspotter M, Inglese M, Rovaris M, et al. A diffusion tensor MRI study of basal ganglia from patients with ADEM. J Neurol Sci. 2003 Jan 15. 206(1):27-30. [Medline]. John L, Khaleeli AA, Larner AJ. Acute disseminated encephalomyelitis: a riddle wrapped in a mystery inside an enigma. Int J Clin Pract. 2003 Apr. 57(3):235-7. [Medline]. Kadhim H, De Prez C, Gazagnes MD, Sebire G. In situ cytokine immune responses in acute disseminated encephalomyelitis: insights into pathophysiologic mechanisms. Hum Pathol. 2003 Mar. 34(3):293-7. [Medline]. Mariotti P, Batocchi AP, Colosimo C,et al. Multiphasic demyelinating disease involving central and peripheral nervous system in a child. Neurology. 2003 Jan 28. 60(2):348-9. [Medline]. Murthy JM. Acute disseminated encephalomyelitis. Neurol India. 2002 Sep. 50(3):238-43. [Medline]. Oksuzler YF, Cakmakci H, Kurul S, et al. Diagnostic value of diffusion-weighted magnetic resonance imaging in pediatric cerebral diseases. Pediatr Neurol. 2005 May. 32(5):325-33. [Medline]. Pena JA, Montiel-Nava C, Hernandez F, et al. [Disseminated acute encephalomyelitis in children]. Rev Neurol. 2002 Jan 16-31. 34(2):163-8. [Medline]. Pradhan S, Gupta RP, Shashank S, Pandey N. Intravenous immunoglobulin therapy in acute disseminated encephalomyelitis. J Neurol Sci. 1999 May 1. 165(1):56-61. [Medline]. Rust RS. Multiple sclerosis, acute disseminated encephalomyelitis, and related conditions. Semin Pediatr Neurol. 2000 Jun. 7(2):66-90. [Medline]. Sakakibara R, Yamanishi T, Uchiyama T, Hattori T. Acute urinary retention due to benign inflammatory nervous diseases. J Neurol. 2006 Aug. 253(8):1103-10. [Medline]. Schwarz S, Mohr A, Knauth M, Wildemann B, Storch-Hagenlocher B. Acute disseminated encephalomyelitis: a follow-up study of 40 adult patients. Neurology. 2001 May 22. 56(10):1313-8. [Medline]. Sunnerhagen KS, Johansson K, Ekholm S. Rehabilitation problems after acute disseminated encephalomyelitis: four cases. J Rehabil Med. 2003 Jan. 35(1):20-5. [Medline]. Tenembaum S, Chamoles N. Acute disseminated encephalomyelitis: a longterm follow-up study of 84 pediatric patients. J Neurol Neurosurg Psychiatr. 1995. 58(4):467-470. Verbruggen SC, Catsman CE, Naghib S, et al. [Respiratory insufficiency caused by acute disseminated encephalomyelitis in a child]. Ned Tijdschr Geneeskd. 2006 May 20. 150(20):1134-8. [Medline]. Weng WC, Peng SS, Lee WT, et al. Acute disseminated encephalomyelitis in children: one medical center experience. Acta Paediatr Taiwan. 2006 Mar-Apr. 47(2):67-71. [Medline]. Wingerchuk DM. The clinical course of acute disseminated encephalomyelitis. Neurol Res. 2006 Apr. 28(3):341-7. [Medline]. Yapici Z, Eraksoy M. Bilateral demyelinating tumefactive lesions in three children with hemiparesis. J Child Neurol. 2002 Sep. 17(9):655-60. [Medline]. Tenembaum S, Chitnis T, Ness J, Hahn JS. Acute disseminated encephalomyelitis. Neurology. 2007. 68(suppl 2):S23-S36. [Full Text]. Dale RC, de Sousa C, Chong WK, Cox TC, Harding B, Neville BG. Acute disseminated encephalomyelitis, multiphasic disseminated encephalomyelitis and multiple sclerosis in children. Brain. 2000 Dec. 123 Pt 12:2407-22. [Medline]. Dale RC. Acute disseminated encephalomyelitis. Semin Pediatr Infect Dis. 2003 Apr. 14(2):90-5. [Medline]. Van Haren K, Tomooka BH, Kidd BA, Banwell B, Bar-Or A, Chitnis T. Serum autoantibodies to myelin peptides distinguish acute disseminated encephalomyelitis from relapsing-remitting multiple sclerosis. Mult Scler. 2013 Nov. 19(13):1726-33. [Medline]. Baumann M, Sahin K, Lechner C, Hennes EM, Schanda K, Mader S. Clinical and neuroradiological differences of paediatric acute disseminating encephalomyelitis with and without antibodies to the myelin oligodendrocyte glycoprotein. J Neurol Neurosurg Psychiatry. 2014 Aug 13. [Medline]. Pröbstel AK, Dornmair K, Bittner R, Sperl P, Jenne D, Magalhaes S. Antibodies to MOG are transient in childhood acute disseminated encephalomyelitis. Neurology. 2011 Aug 9. 77(6):580-8. [Medline]. Brilot F, Dale RC, Selter RC, Grummel V, Kalluri SR, Aslam M, et al. Antibodies to native myelin oligodendrocyte glycoprotein in children with inflammatory demyelinating central nervous system disease. Ann Neurol. 2009 Dec. 66(6):833-42. [Medline]. Di Pauli F, Mader S, Rostasy K, Schanda K, Bajer-Kornek B, Ehling R. Temporal dynamics of anti-MOG antibodies in CNS demyelinating diseases. Clin Immunol. 2011 Mar. 138(3):247-54. [Medline]. Murthy SN, Faden HS, Cohen ME, Bakshi R. Acute disseminated encephalomyelitis in children. Pediatrics. 2002 Aug. 110(2 Pt 1):e21. [Medline]. Leake JA, Albani S, Kao AS, Senac MO, Billman GF, Nespeca MP, et al. Acute disseminated encephalomyelitis in childhood: epidemiologic, clinical and laboratory features. Pediatr Infect Dis J. 2004 Aug. 23(8):756-64. [Medline]. Pohl D, Hennemuth I, von Kries R, Hanefeld F. Paediatric multiple sclerosis and acute disseminated encephalomyelitis in Germany: results of a nationwide survey. Eur J Pediatr. 2007 May. 166(5):405-12. [Medline]. Torisu H, Kira R, Ishizaki Y, Sanefuji M, Yamaguchi Y, Yasumoto S. Clinical study of childhood acute disseminated encephalomyelitis, multiple sclerosis, and acute transverse myelitis in Fukuoka Prefecture, Japan. Brain Dev. 2010 Jun. 32(6):454-62. [Medline]. Hynson JL, Kornberg AJ, Coleman LT, Shield L, Harvey AS, Kean MJ. Clinical and neuroradiologic features of acute disseminated encephalomyelitis in children. Neurology. 2001 May 22. 56(10):1308-12. [Medline]. Krupp LB, Tardieu M, Amato MP, Banwell B, Chitnis T, Dale RC, et al. International Pediatric Multiple Sclerosis Study Group criteria for pediatric multiple sclerosis and immune-mediated central nervous system demyelinating disorders: revisions to the 2007 definitions. Mult Scler. 2013 Sep. 19(10):1261-7. [Medline]. Hung KL, Liao HT, Tsai ML. The spectrum of postinfectious encephalomyelitis. Brain Dev. 2001 Mar. 23(1):42-5. [Medline]. Mikaeloff Y, Suissa S, Vallée L, Lubetzki C, Ponsot G, Confavreux C, et al. First episode of acute CNS inflammatory demyelination in childhood: prognostic factors for multiple sclerosis and disability. J Pediatr. 2004 Feb. 144(2):246-52. [Medline]. Idrissova ZhR, Boldyreva MN, Dekonenko EP, Malishev NA, Leontyeva IY, Martinenko IN, et al. Acute disseminated encephalomyelitis in children: clinical features and HLA-DR linkage. Eur J Neurol. 2003 Sep. 10(5):537-46. [Medline]. Anlar B, Basaran C, Kose G, Guven A, Haspolat S, Yakut A, et al. Acute disseminated encephalomyelitis in children: outcome and prognosis. Neuropediatrics. 2003 Aug. 34(4):194-9. [Medline]. Jacobs RK, Anderson VA, Neale JL, Shield LK, Kornberg AJ. Neuropsychological outcome after acute disseminated encephalomyelitis: impact of age at illness onset. Pediatr Neurol. 2004 Sep. 31(3):191-7. [Medline]. Hahn CD, Miles BS, MacGregor DL, Blaser SI, Banwell BL, Hetherington CR. Neurocognitive outcome after acute disseminated encephalomyelitis. Pediatr Neurol. 2003 Aug. 29(2):117-23. [Medline]. Brenton JN, Koenig S, Goldman MD. Vitamin D status and age of onset of demyelinating disease. Multiple Sclerosis and Related Disorders. 2014. [Full Text]. Mowry EM, James JA, Krupp LB, Waubant E. Vitamin D status and antibody levels to common viruses in pediatric-onset multiple sclerosis. Mult Scler. 2011 Jun. 17(6):666-71. [Medline]. Banwell B, Bar-Or A, Arnold DL, Sadovnick D, Narayanan S, McGowan M. Clinical, environmental, and genetic determinants of multiple sclerosis in children with acute demyelination: a prospective national cohort study. Lancet Neurol. 2011 May. 10(5):436-45. [Medline]. Munger KL, Levin LI, Hollis BW, Howard NS, Ascherio A. Serum 25-hydroxyvitamin D levels and risk of multiple sclerosis. JAMA. 2006 Dec 20. 296(23):2832-8. [Medline]. Mikaeloff Y, Caridade G, Husson B, Suissa S, Tardieu M. Acute disseminated encephalomyelitis cohort study: prognostic factors for relapse. Eur J Paediatr Neurol. 2007 Mar. 11(2):90-5. [Medline]. McKeon A, Lennon VA, Lotze T, Tenenbaum S, Ness JM, Rensel M, et al. CNS aquaporin-4 autoimmunity in children. Neurology. 2008 Jul 8. 71(2):93-100. [Medline]. Saiki S, Ueno Y, Moritani T, Sato T, Sekine T, Kawajiri S. Extensive hemispheric lesions with radiological evidence of blood-brain barrier integrity in a patient with neuromyelitis optica. J Neurol Sci. 2009 Sep 15. 284(1-2):217-9. [Medline]. Eichel R, Meiner Z, Abramsky O, Gotkine M. Acute disseminating encephalomyelitis in neuromyelitis optica: closing the floodgates. Arch Neurol. 2008 Feb. 65(2):267-71. [Medline]. Kaneko K, Sato DK, Misu T, Kurosawa K, Nakashima I, Fujihara K. Anti-N-methyl-D-aspartate receptor encephalitis with multiphasic demyelination. Ann Neurol. 2014 Sep. 76(3):462-4. [Medline]. Okumura A, Nakazawa M, Igarashi A, Abe S, Ikeno M, Nakahara E, et al. Anti-aquaporin 4 antibody-positive acute disseminated encephalomyelitis. Brain Dev. 2014 May 16. [Medline]. Titulaer MJ, Höftberger R, Iizuka T, Leypoldt F, McCracken L, Cellucci T, et al. Overlapping demyelinating syndromes and anti–N-methyl-D-aspartate receptor encephalitis. Ann Neurol. 2014 Mar. 75(3):411-28. [Medline]. [Full Text]. Huppke P, Rostasy K, Karenfort M, Huppke B, Seidl R, Leiz S, et al. Acute disseminated encephalomyelitis followed by recurrent or monophasic optic neuritis in pediatric patients. Mult Scler. 2013 Jun. 19(7):941-6. [Medline]. Shaw CM, Alvord EC Jr. Multiple sclerosis beginning in infancy. J Child Neurol. 1987 Oct. 2(4):252-6. [Medline]. Maeda Y, Kitamoto I, Kurokawa T, Ueda K, Hasuo K, Fujioka K. Infantile multiple sclerosis with extensive white matter lesions. Pediatr Neurol. 1989 Sep-Oct. 5(5):317-9. [Medline]. Vliegenthart WE, Sanders EA, Bruyn GW, Vielvoye GJ. An unusual CT-scan appearance in multiple sclerosis. J Neurol Sci. 1985 Nov. 71(1):129-34. [Medline]. Noorbakhsh F, Johnson RT, Emery D, Power C. Acute disseminated encephalomyelitis: clinical and pathogenesis features. Neurol Clin. 2008 Aug. 26(3):759-80, ix. [Medline]. Cohen SR, Brooks BR, Herndon RM, McKhann GM. A diagnostic index of active demyelination: myelin basic protein in cerebrospinal fluid. Ann Neurol. 1980 Jul. 8(1):25-31. [Medline]. Höllinger P, Sturzenegger M, Mathis J, Schroth G, Hess CW. Acute disseminated encephalomyelitis in adults: a reappraisal of clinical, CSF, EEG, and MRI findings. J Neurol. 2002 Mar. 249(3):320-9. [Medline]. Tenembaum S, Chamoles N, Fejerman N. Acute disseminated encephalomyelitis: a long-term follow-up study of 84 pediatric patients. Neurology. 2002 Oct 22. 59(8):1224-31. [Medline]. Kleiman M, Brunquell P. Acute disseminated encephalomyelitis: response to intravenous immunoglobulin. J Child Neurol. 1995 Nov. 10(6):481-3. [Medline]. Keegan M, Pineda AA, McClelland RL, Darby CH, Rodriguez M, Weinshenker BG. Plasma exchange for severe attacks of CNS demyelination: predictors of response. Neurology. 2002 Jan 8. 58(1):143-6. [Medline]. Rust RS, Mathisen J, Prensky AL, et al. Acute disseminatedencephalomyelitis (ADE) and childhood multiple sclerosis(MS). Ann Neurol. 1989. 26:467. Typical childhood ADEM in 7-year-old. Note tendency to involve gray-white junction, the fact that the lesion margins are less well defined than typical MS plaques, and that the deep white matter lesions are not oriented perpendicularly to the ventricular surface as is typical in MS. Typical adolescent multiple sclerosis findings on MRI. 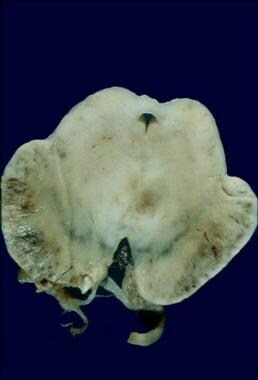 Note the tendency of lesions to exhibit sharp margins, to be elongated, to occur in deep white matter or corpus callosum sparing the cortical gray-white junction, and to be oriented perpendicularly to the ventricular surface. Disclosure: Serve(d) as a director, officer, partner, employee, advisor, consultant or trustee for: Novartis.